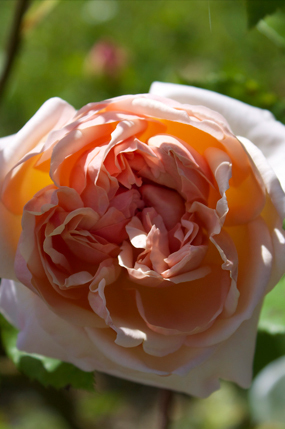 Fragrance is one of the benefits of a garden that is often overlooked. Lots of thought is given to plants’ textures, colors, seasonality, sizes—all important visual characteristics without a doubt—but a garden with scents provides a deeper, richer experience by supplementing visual stimuli with olfactory. Fragrances, like music, often elicit memories, and so this short list of favorite fragrant plants includes a number that I experienced when I was younger. People, places, time—all are recalled with great fondness in a single whiff. 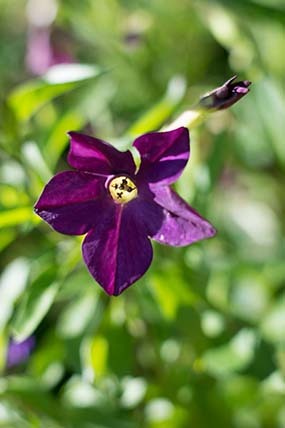 Also among the list are a number of annuals that are perfect for containers, which allow the gardener to move plants into prominence as they reach their peak throughout the season. Finally, I believe every garden should have a least one rose; and that it should be fragrant. 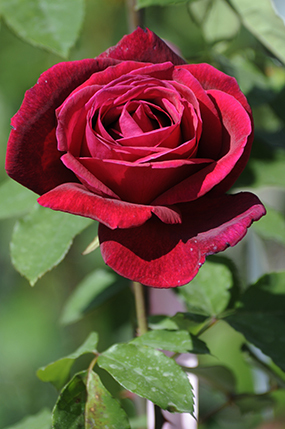 Rosa ‘Mister Lincoln’, with deep velvety red petals and incredible tea rose fragrance, has stood the test of time. Both Honey Perfume™ (Rosa ‘JACarque’) and Rosa ‘Apricot Nectar’ reflect the current desire to combine fragrance with beauty and disease resistance in a hardy shrub rose. 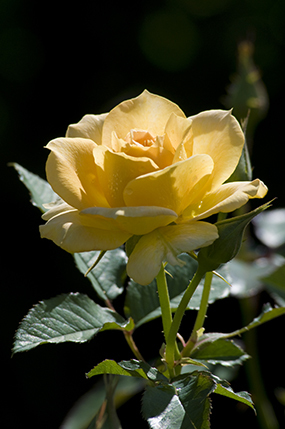 The Chicago Peace rose (Rosa ‘Chicago Peace’) earned a place at the top of our list long before we moved to Chicago with its creamy yellow flowers tinged with pink along the edges of the petals and a delicate rose fragrance. My wife would be upset if I didn’t mention her favorite, a David Austin shrub rose by the name of Evelyn (Rosa ‘AUSsaucer’), which bears delicate apricot-to-pink single-to-double quartered flowers—and a wonderful fragrance. Photo by Patrick Nouhailler [CC 2.0]. 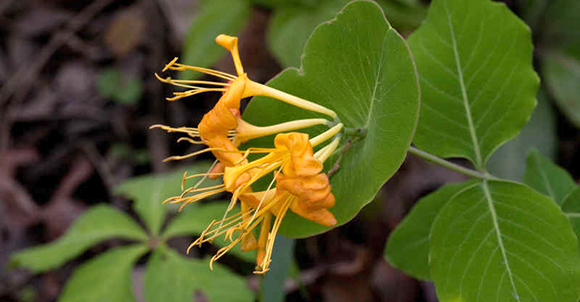 Honeysuckles are among the most fragrant of garden plants available, but many of the most common are non-native and have begun to “jump the fence” and invade natural areas. Many of the sterile cultivars, unfortunately, are not fragrant, and the species native to the southeastern United States are not reliably hardy (Lonicera sempervirens). Fortunately Lonicera flava—also native to this region—is fragrant. Its yellow-to-orange summer blooms are followed by showy (but inedible) berries in fall. Lonicera flava honeysuckle is a fragrant and hardy variety. Photo via southeasternflora.com. Tuberose, Polianthes tuberosa, is a nonhardy (for us) bulb from northern Mexico with an intoxicating scent so distinctive it is known simply as “tuberose.” Creamy white flowers on spikes appear from late summer up to frost. Like many fragrant plants, the scent was developed to attract night-flying pollinators and becomes more intense as late afternoon transitions to evening. Tuberose is great in a large container or can be planted in flower beds. Hosta have long been used by gardeners to fill parts of the garden that are heavily shaded. While they all flower, ‘Royal Standard’ (among others), produces large, white intensely fragrant (in the evening) flowers in late summer. 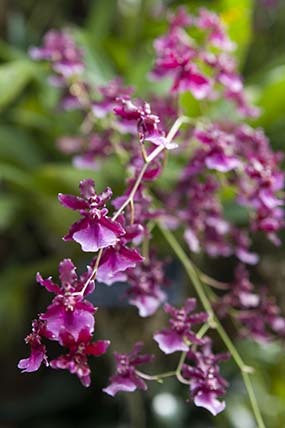 One of the featured plants from the Garden’s recent Orchid Show, Oncidium Sharry Baby ‘Sweet Fragrance’ is easily grown on a brightly lit windowsill in the home. A relatively small plant maturing at about 6 inches in height, it produces sprays of pinkish red, sweetly fragrant flowers almost year-round. It’s not overpowering. At the end of the daffodil season, end of May to the beginning of June, a small-statured Narcissus jonquilla fills the garden with delightfully sweet scents. Relatively small in stature, the bright yellow flowers, one to three per stem, are produced above grass-like foliage. Unlike some of the larger leafed cultivars, there is rarely a need to fuss with the foliage as it dies back. Tuck it in among perennials and small shrubs. Garden stock (Matthiola incana) is another one of those plant groups that for a while, featured size, shape, and color of the flowers at the expense of fragrance. Fortunately the pendulum has swung back and a number of modern cultivars feature fragrance in addition to some really cool colors. Crabapples bloom here at the Garden, reliably on Mother’s Day, and their fragrance is another one so distinctive as to be given its own name. 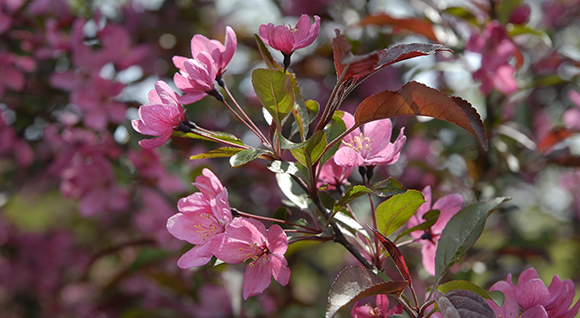 Malus ‘Prairifire’ is not only fragrant, but is smaller in size—perfectly suited for modern gardens. It features white to pink flowers and showy red fruit in fall. The herbaceous peony Festiva Maxima is an old cultivar but its fragrance has earned it a spot in the moving van during every move. 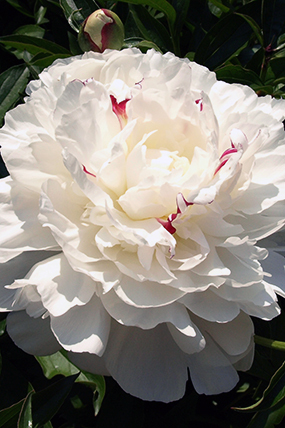 White flowers flecked with red have that wonderful peony fragrance. It needs staking and if planted in a crowded location, is susceptible to powdery mildew. Recipes online provide instructions on using the petals to make peony-scented jelly—a very delicate, flavored sweet with a light pink color. Small nectar glands on the sides of the flower buds attract small ants to the plants. The ants don’t pollinate the flowers, but they are important to the dispersal of the seeds later in the year. The seeds feature an elaiosome (fleshy appendage) that the ants strip off and feed upon once they have hauled the seed to their nest—insuring the dispersal of peony seeds. The nectar is simply there to make sure they are around when the seeds are ripe. Many of the garden phlox, Phlox paniculata, feature a vanilla clove fragrance in mid-summer. The cultivar ‘David’ features pure white flowers on disease-resistant foliage. I let it reseed in the garden, and the results are spectacular—the offspring feature light to dark lavender flowers surrounding the white parent. 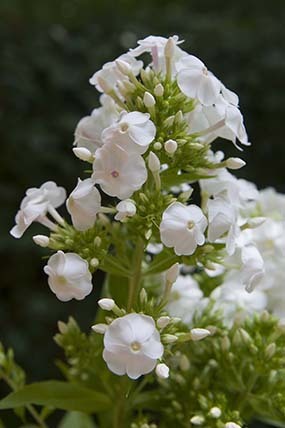 Fragrant tobacco, Nicotiana alata, produces tall spikes of sweetly scented long, tubular white flowers throughout the summer. I let mine reseed underneath the dryer vent, ensuring a return the following year. This plant is great in containers or used as an in-ground annual. Clove currant (Ribes odoratum) is an underutilized medium-sized shrub with bright yellow flowers with, you guessed it, the scent of cloves. This is a great plant as a mounded specimen or can be utilized as a hedge. Butterfly bushes are another of the “must have” sweetly scented garden plants. Like others on this list, the cultivars I grew up with have developed a bad habit of “jumping the fence” and invading natural areas. Plant breeders have risen to the challenge and produced a number of sterile hybrids. Lo & Behold Blue Chip is smaller in stature with lavender-to-blue flowers with the classic fragrance. Asian Moon is a larger growing cultivar with deep purple petals surrounding the orange throat and a rich, sweet fragrance. Pineapple sage, Salvia elegans, is a classic selection for a “brush against” plant for a location near a walkway or door. Dill, parsley, basil, thyme, rosemary, scented geraniums, and many other herbs can be selected to add their notes to the garden, depending on the gardener’s tastes. 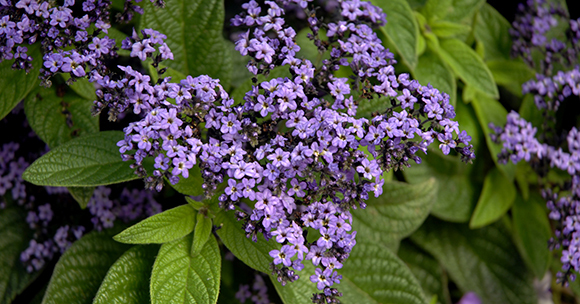 Heliotrope, Heliotropium arborescens, rounds out the favorites list. Deep purple flower clusters add a wonderfully sweet scent to the landscape and work out well in containers or in-ground locations. The best fragrance among native plants (to me) is milkweed…Common Milkweed hosts the larvae of the monarch butterfly which is reason enough to plant it, but its flowers are also beautiful and spicily fragrant. Next Next post: Daffodils Are Here!